Tossa de Mar with its castle and walled older part over looking the sea is one of the most popular Costa Brava destinations but it is separated from Sant Feliu de Guixols by the Massif de Cadiretes and high cliffs with a single very windy road that makes coastal walking challenging. However, having walked the GR92 routes to the south last year of Tossa de Mar last year, our aim this time was to explore more of the northern parts and into the hills at the back of Tossa. Our starting point was parking near to the river just outside the centre of the town. Despite being Easter Monday, parking was very easy and the town itself felt like a place slowly still waking from its winter hibernation. The main tourists seemed to be French in small groups rather than the sea that washes over the town during the main summer season. At this time of year, the sea is still too cold for any but the most hardy of swimmer or those with wetsuits. Normally there would be enough sun for a few sunbathers on the beach, but the Easter weather has been relatively overcast this year. We almost follow the river down to the beach past blocks of rented apartments and hotels with early visitors visible on the balconies. Tossa is very popular because of its beach and compact historic centre and is full of low rise hotels and bars and restaurants, maintaining its traditional character, but still more focused on tourists than the Costa Brava villages of Emporda. At the beach we follow the road around to the left towards the beach of Mar Menuda in the opoosite direction of the castle. 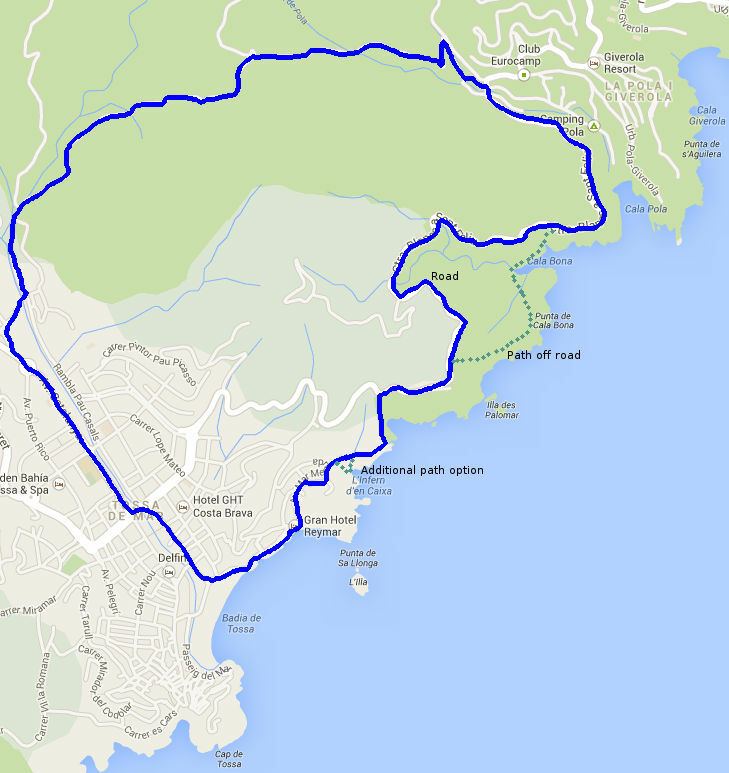 For this walk we want to explore newer areas so we're heading out to the hillier north. Just before the Mar Menuda beach, we take the last junction to the left and head up the hill past the back of a couple of hotels. The road reaches a switchback corner and according to the map we should be able to continue straight on, but the road looks more like a private driveway. As we're pondering whether it's the right way some Catalan walkers catch up with us and tell us it is the right way. Looking closely we can see a green flash painted on the post next to the entrance to the path/drive. The path turns into a track and splits in two. To the right the route is now signposted to Cala Bona, Cala Pola and Cala Giverola which are the coves we are heading for, but we can see from the map that the path must go down (To the L'Infern d'en Caixa) and then back up to meet the path ahead of us, so we continue straight on. Our path climbs up towards the road above us, but firstly we pass a viewing point marked by a clearing and a wooden pole from where you can look back to Tossa. It's actually high up on a cliff top over the sea (about 150-250 feet up) and I discover I'm rather closer to the edge than I'd like with the result that I catch a dose of vertigo. We climb the track up to the viewing point on the road and then have to follow the road for a while. The road is quiet. 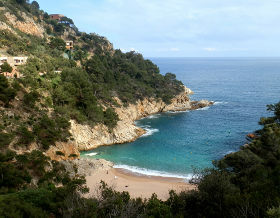 Though it is the most direct route between Tossa de Mar and Sant Feliu de Guixols, it is an extremely bendy road across the cliff-tops and in and out of the bays and so extremely slow going, and with no turn off alternatives. The main visitors who use it are tourists and so it has traffic in summer but few cars now. In fact the main travellers we see are club or pro-cyclists out for a day trip (the route Girona, Sant Feliu, Tossa is about 100km/60 miles round trip). The road climbs to the next corner and we see a sign-post for the path to Cala Bona down into the next bay. Unfortunately I'm still feeling spooked by the earlier cliffs and we're a little higher now so as the road is relatively quiet we choose to stick to the road as it turns inland and around the back of the natural little cove of Cala Bona down towards the sea. On the far side of the curl we find the path again as it rejoins the road, though there is also a path below the road that comes into the next bay of Cala Pola. Cala Pola is an odd mixture of developed houses, what looks like a hotel, and campsite above a sandy beach in Cala Pola itself. It feels quite isolated as there are no other facilities nearby other than the resort itself, which at this time of year has just a handful of people around - with 5 or 6 down on the beach below us. We walk around to the back of the campsite across a bridge and then start our route into the hills. The path loops round the back of the campsite and at times it's not clear what is private and what is public, but there are signmarkers around if you look. 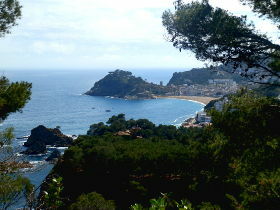 The path climbs up into the hills at the back and we leave the sea and the bay behind us into the pines. The path climbs to a col where we meet the GR92 path as it heads up into the Cadrites hills as it continues to Sant Feliu. The GR92 between Tossa and Sant Feliu does not follow the coast probably because it would have to follow the same route as the road. Instead it climbs up into the higher Cadrites above us (500m) - about the same height as the Gavarres, but from our path it looks higher and steeper. We turn down the GR92 and head down the hill back towards Tossa de Mar with a typical walk through Mediterranean woods along a gravel track. As we reach the bottom of the hill we emerge by the river which at this time of year has running water and tadpoles and connects to a small park at the back of the sports area for Tossa de Mar. Update: Cala Pola was used for the 2014 summer's Estrella Damm advert (it was Pals/Platja del Roca beach in 2013).